More crazy dreams! 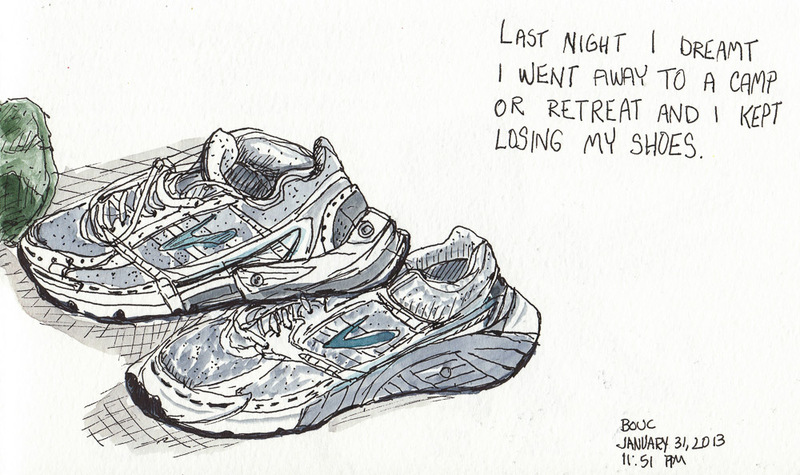 The night after the lost keys dream, I dreamed I was at a retreat where I kept losing my shoes. So of course I had to draw them, just to be sure they were still here. Lately my every-day sneakers have started untying themselves several times a day. So then I dreamed that Justin Bieber and Justin Timberlake were giving me hands-on shoe-tying advice. They unlaced my shoes and then snipped the laces into small pieces. They explained that you need a separate piece for each set of holes and then you knot each piece to the next. We started running out of laces. I think I’ll just start double-knotting them, thanks. Or maybe it’s time for new shoes? Yes those are magenta polka dots on my ancient Birkenstocks: I painted the funky old shoes with acrylic paint dots and it worked great. I’m definitely not a high heels kind of girl as you can see. Easy Spirit makes good soles and zipper tops so you can’t trip on untied laces. Love the composition and color. 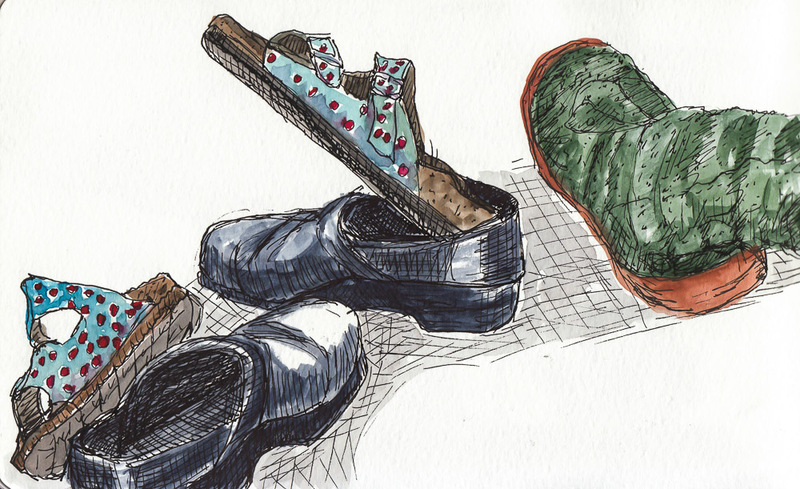 I have been thinking about doing a pile of my shoes. I was inspired by Barry Combbs who had his class paint a pile of shoes. What fun! PS I have to double knot my white tennis shoes too. They always come untied when I have a dog leash in each hand. How great that you have two dogs but that must make it challenging to tie your shoes. After the third time stopping to tie my shoes on a walk with a friend she made me double knot them and now I do it automatically.